« Macross Frontier for SHINJUKU MARUI ONE!!!!! ‘Fujisan Onsen Kaneyama-en’ is located at the site in which easy access from the Lake Kawaguchi-ko IC within 15 minutes. What attracts arrival guests to this hotel is, above anything else, the best view of Mt. Fuji. Fujiyoshida (富士吉田市,) is a city where ‘Kaneyama-en’ is located in Yamanashi Prefecture, in the center of the Japanese main island of Honshu. It is considered a high-elevation city in Japan, at 2,140 to 2,800 feet above sea level. The city is also located between two of the five Fuji Lakes, Lake Kawaguchi and Lake Yamanaka. Fujiyoshida is the largest city on the North Slope of Mount Fuji and features access to historical sites, amusement parks, hot springs, access to hiking and camping in the Fuji Five Lakes system, and is the traditional Northern gateway to climbing Mount Fuji. As we talk about the attractiveness of ‘Kaneyamaen’, indispensable part is its good location. Its total precinct of about 82,500㎡ is located in the place where you can observe a beautiful view of Mt. Fuji. Although, Mt. Fuji can be observed from the existing grand bath, it is not a whole view. New outdoor grand bath is built for providing a view of the entire Mt. Fuji while bathing in onsen. A whole view of Mt. 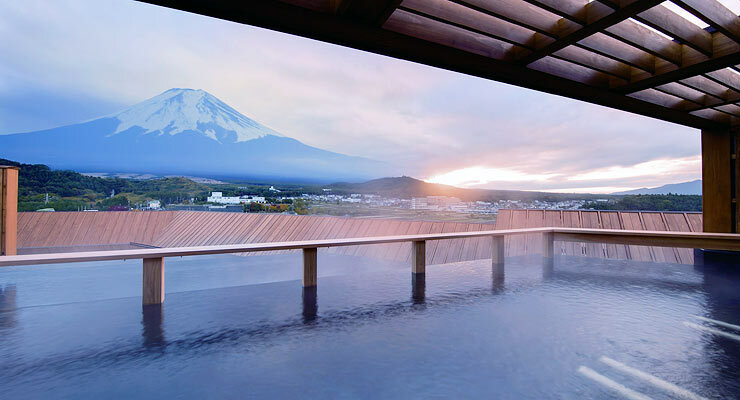 Fuji can be observed only from the outdoor bath with in the special suite room, while bathing. Grand bath ‘Fujisan’ or an outdoor bath Mt. Fuji, is laid out on the rooftop floor of the guest house No. 3 named ‘Sairyu-tei’. There is no washing area or shower booth arranged with bathtub. After stepping up from the dressing room to the floor, there are different 3 tiers of wide bathtubs in which provide a whole view of Mt. Fuji from each without disturbing the sight. The shallow 60cm bathtub on the highest part is provided for ‘neyu’ or bed-style bath and other two, arranged on the middle and lowest tiers are normal depth of 90cm bathtubs. Natural hot spring water is derived from the own hot spring well dug out in 1993. Total investment for the new outdoor bath is 200 million yen. The highest tier of the outdoor bath is a shallow 60cm bed-style bath. 3 tiered bathtubs are quite unique in which never disturb the panoramic view of Mt. Fuji while bathing. The new outdoor grand bath is not open for day trippers without stay over night, so that you must stay at least one night at the hotel. It is also alternately open for ladies and gentlemen on the scheduled hours. From 6:00 to 11:00 in the morning is for ladies and 14:00-19:00 is for men. 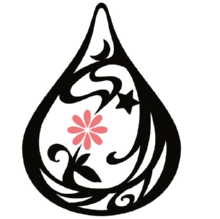 As a certified guide-interpreter in English and also a writer of the website “Cool Japan Guide”, I am very happy to introduce Fujisan ‘Onsen Kaneyama-en’ in Yamanashi. If you like to make a reservation or something to ask, please feel free to contact us. Thank you for your kind cooperation, I am looking forward to your contact.